A fun and delightful quilt! Great primary color selections. 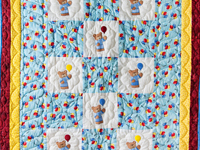 The embroidered bears and balloons are cute and cheerful. Notice the really tiny hand quilted stitches. Well made by an Amish woman in her Lancaster County, Pennsylvania home. Includes a sleeve for a hanging rod. The back of the quilt is covered with a soft yellow fabric. 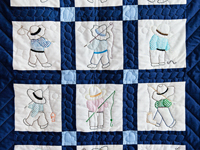 A quilt that is sure to please! 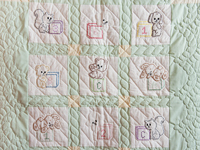 What a cute baby quilt! 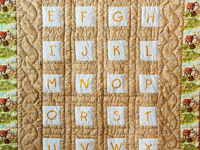 Each letter of the English alphabet is neatly embroidered on it's own block. Notice the pretty butterflies on the soft brown fabric. 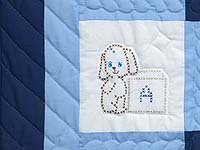 A cute, baby animal farm scene fabric borders the quilt. The back fabric coordinates well with the front of the quilt. The hand quilting is exceptionally well done with tiny, even stitches. Well made by an Amish woman in Lancaster County, Pennsylvania. Includes a sleeve for a hanging rod. 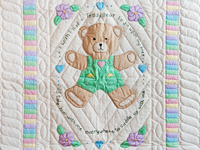 A soft, sweet, tender quilt for a special baby! 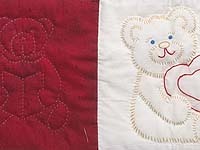 Blocks of hand embroidered animals make this a one of a kind quilt! Very soft, pastel coloring. Well made and beautifully quilted. Made in Lancaster County, Pennsylvania by an Amish woman. Sure to become a family heirloom! A very special, one of a kind, embroidered quilt! 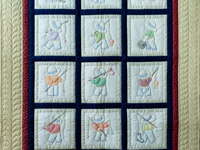 12 hand embroidered blocks featuring cute little boys in various fishing poses. Hand quilted with tiny, neat stitches. Well made by an Amish woman in her Lancaster County, Pennsylvania home. Back is covered with a solid, light blue, cotton fabric and has the date made and initials of it's maker embroidered in a corner. Charming collection of baby animals with toy blocks. Excellent cross stitching and fine quilting. Made here in Lancaster by Amish girls (with a little help from the mothers) in a workshop for handicapped Amish children. 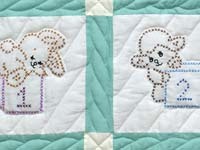 Cute collection of embroidered and quilted bear cubs. Excellent embroidery and lots of fine quilting. Note that the 'patchwork' blocks use use a single piece of a cotton print that has a patchwork design, instead of being pieced.